Beck calls the first one "intention revealing" names. Yes, but I struggle with using that. I wanted to press the "windshield" v. "front glass", just as "name" verses "long string", etc. I think that intention-revealing as a soundbite didn't quite say that to everybody. "I intended it to be an arbitrary integer variable" is hard to defend in that way. I think I could fold the second-to-last and third-to-last together (and some others I cut out) by switching to the statement "scope is context". It's less obvious, but once you've heard it it should help. More-inner-scope variables have more context, need less explicit statement of type/etc. More global ones need more explicit differentiating. The '.' is a naming element so database.gateway.Customer.byId() is a very long name with a pretty obvious scope. Likewise, any variable in the method is scoped clearly enough that you don't need a lot of name redundancy. Likewise, having things in Customer.Customer.customer_by_id() looks stupid. Likewise any gratuitous branding looks moronic: timco.timcoWebApp.timcoCustomer.getTimCoCustomerbyId() hardly look like the work of a sane person. Context is naming, naming is context. If you 'dot in' context by nested namespaces or you glue warts onto the front or back of your class, it's all naming. And yes, Kent should get credit for "intention-revealing". I agree. Is the last rule supposed to be there for humor purposes? All of the other rules have more general applicability; this one is fairly specific and narrow. 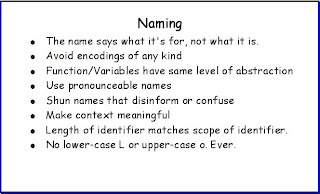 "Length of identifier matches scope of identifier"--"matches" connotes equality to me; how about something like "Identifier length in proportion to scope"
I agree with most of the points but I completely disagree with the last bullet about lower case Ls and upper case Os. I've never found it a problem and am struggling to contrive one. Sure, avoid them if there is an equally good name that doesn't use them, but don't pick a worse name so as not to break that rule. ps. Good blog and thanks for posting! it's still here so you are not too late. There have been plenty of cases where l and 1 have neeb confused and caused misunderstandings and even bugs. If someone sees "if x == l". It certainly seems like one could simplify it to "if x" to keep it simple and small. Likewise 0 and O. They might look different enough side-by-side but scattered in code it is rough. If nothing else, imagine you want to copy the code into an article or document... surely another name might lead to fewer reader typos. That is really all there is to it. A bad name is one that seems to be saying something other than it really means. I can buy that last rule if you mean "No lower-case L or upper-case o, by themselves or not as an integral part of a full word." But if you mean my names can't contain a lowercase L or an uppercase O then that's ridiculous. That would mean that "lastName" is unacceptable, as would be "getOfficePhone()," neither of which could be reasonably misunderstood. I hope I never work with the code of someone who misunderstood the spirit of the rule. My intent was that the name should never be composed of only those two letters, lest it look like a number. In a day where IDEs weren't all that (i.e. no warnings surfaced), it took me a little bit of time to spot my mistake.